'Jock' Lewes: SAS mastermind – an article via the National Army Museum London, with images and information supplied by John Lewes. You'll be £14.99 closer to your next £10.00 credit when you purchase Jock Lewes: Co-Founder of the SAS. What's this? Drawing on hitherto unpublished personal journals, this account of John Lewes’s life, tragically cut short on 31 December 1941 during a SAS deep penetration patrol, makes for a compelling read. Brought up in the Australian out back where he learnt self-discipline and self-reliance, he went on to have a brilliant career at Oxford University, as President of the Boat Club he was instrumental in the dramatic 1937 victory against Cambridge. Thereafter he spent time in pre-war Berlin where he was first seduced by Hitler’s socialist policies and by a young Nazi supporter, one of the two loves of his life, but soon became disillusioned, establishing links with opposition factions. Despite his lack of military experience, Jock quickly proved himself a radical tactical thinker and brilliant leader and trainer of men, a rare combination. He also developed, and gave his name to, the lethally effective Lewes Bomb. His exceptional talents found statement in the development of the SAS concept and the ethos. Without his and David Stirling's partnership there would have been no Special Air Service; as Stirling later chivalrously admitted, 'Jock Lewes could far more genuinely claim to be the founder of the SAS than I'. As well as being the long overdue biography of this highly gifted and complex individual, Jock Lewes, Co-founder of the SAS, is a major contribution to the bibliography of British Special Forces. On November 16/17, 1941, the fledgling SAS (Special Air Service) carried out its first mission under the banner Operation Squatter. Much credit is given to David Sterling for the formation of SAS but the actual concept of the special unit was the brainchild of Jock Lewes in May 1941 which was originally known as ‘L’ detachment, Special Air Service Brigade. One of the many reasons why Jock’s memory has been erased from the history of the SAS was his untimely demise during the second operation and from then on Sterling was the man at the helm, his place in the history books was secure. This book helps to put that straight and gives rightful credit to Jock’s contribution to one of the world’s elite military units. This is endorsed from the outset by a David Sterling quote on the front cover 'Jock could far more genuinely claim to be the founder of the SAS than I'. Timed with the 75th Anniversary of Operation Squatter, Pen & Sword have re-published this work by the subject’s nephew John Lewes. A large proportion of the book deals with Jock’s pre-war life and what must be said, was a privileged upbringing. With particular focus on Jock’s rowing prowess and antics at university, the early life of this man is essential to understanding more about his achievements during the early stages of the Second World War in North Africa. The jury is still out for many hard-core SAS historians as to who did what and when during those early days of the service in 1941, but it is quite obvious Jock Lewes played a major role. Thanks very much to Pen & Sword for our review copy; highly recommended! Well written and very informative on a range of subjects, not least the 'insider's' perspective of the creation of the SAS. No doubt of value to social as well as military interest readers. Like all good biographies, the author has clearly spent a vast amount of time and effort researching Jock's life, creating a full picture of the man and indeed his personality. Resulting in a book that is testimony to Jock's life and for what he did for the SAS. If you would like to read beyond myth grab yourself a copy. Throughout the book Lewes comes through as a very determined man with incredible drive, and I think this is more than demonstrated with the troubled birth of the SAS. I believe his nephew has written a fitting and honourable account of Jock’s relatively short life. I enjoy books that are challenging and stimulating; ones that increase my knowledge and understanding. This book falls neatly into this category. I do not have much knowledge or interest in the Special Air Service (S.A.S.) during the Second World War, so approached this book with an open mind. Primarily, this is a biography of Lieutenant John Steel LEWES, Welsh Guards, or as he is better known, Jock LEWES of ‘L’ Detachment, Special Air Service Brigade. A member of his family wrote it, so it could be inclined to show a more favourable account than an impartial author, but in this case, I believe the balance is struck well. The author has drawn upon a large number of personal accounts, as well as primary documentary sources, to produce a full account of his life. Readers should not expect an account of actions or battles, in part because the subject was killed on only his second operation, but the true value of this book is the genesis and formation of the S.A.S. in wartime Egypt, and the role played by LEWES. Half the book is taken up with his life before the war, but this is appropriate as we gain an insight into a facet of life in the pre-war period, the nature and personality of the man concerned. The chapters on the formation of the S.A.S. reveal how much the creation of The Regiment was down to perseverance, an element of luck, and sheer hard work. David STIRLING may be described as the brains behind the formation of the S.A.S., but Jock LEWES was its heart. In conclusion, the author has provided what I consider to be a balanced, well researched, and informative account of the life of Jock LEWES, and the instrumental role he played in the formation of the S.A.S.. I hope you enjoy the book as I did. I have always found history, especially about the Welsh Guards, interesting and informative. I cam across the following information on the late Lieutenant John Steel Lewes (a.k.a Jock Lewes), whose nephew John Lewes is the author of this excellent book. 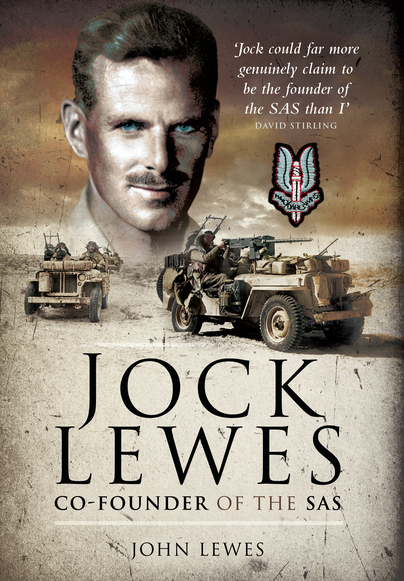 As well as being the long overdue biography of this highly gifted and complex individual, "Jock Lewes, Co-Founder of the SAS", is a major contribution to the bibliography of British Special Forces and is fully endorsed by Lord Jellicoe in his Forewrad: "It is described with skill and authority". John Lewes, John's nephew and author of this stunning biography, has had the fullest possible access to Jock's private papers and this provides the reader with fascinating and important new information about the formation of the SAS. ... The question of who the "real" founder of the SAS was is a popular field sport among SF enthusiasts. As the nephew of his subject, the author can be forgiven his championship of his uncle's claim. This is especially the case as Jock Lewes' importance has tended to be neglected, sadly, simply because of his early death. This book offers an important corrective. This is an essential book for serious students of the Special Air Service and special operations, as can be judged from the times it is referenced in other works on the same subject. It is also a valuable description of the preparation and early service of a dedicated young officer, and is written in a readily accessible style. This is a remarkable war and love story, when you combine Jock Lewes's Book with Joy Street the story of his love affair, with his fiancee Miriam. It is time that Jock's life and his sacrifice is recognised. A major contribution to the early history of the SAS, this outstanding biography of Jock Lewes persuasively argues that he was the real founder of the elite British commando corps in World War II not David Stirling. Lewes had not only developed the concept of the corps but had begun training his men before he was joined by David Stirling. Lewes was a brilliant innovator, experimenting with early parachute techniques and creating the Lewes bomb, who was initially sceptical of enlisting Stirling. Written by his nephew, with access to family friends and unused private papers, the biography successfully argues its case without doing an injustice to Stirling. On the contrary, it shows that the ultimate success of the unit was due to a successful partnership in which the two men played distinct but essential roles. Stirling was crucial in promoting support for the formal adoption of the SAS among doubtful commanders at HQ. The biography reads like a good thriller maintaining suspense throughout. Well over half the book is devoted to the years before the war, beginning with his boyhood in Australia. There are memorable vignettes of Oxford in the 1930s, where Jock led the Oxford University Boat Club in its first victory against Cambridge in many years, and the Berlin Olympics. Jock emerges in these early chapters as a charismatic and visionary leader long before his founding of the SAS. A work of revision which will change the text book accounts of the origins of the SAS. A great read from beginning to end... a remarkable man with incredible drive and determination, I just did not want it to end! A page turner, it keeps you rapt. A superb book on the beginnings of the SAS. In 2012, John Lewes opened the new SAS War Diary Display at Airborne Assault at IWM Duxford. The author still holds the very first SAS notebook which is currently unpublished. See a picture of the front cover of the first notebook with the first SAS plans and jottings by Lt. Jock Lewes. A few years before, the author spoke at the Unveiling of the Jock Lewes Memorial at an army base in Hereford. His Royal Highness Prince William unveiled the magnificent bronze statue of Lieutenant Jock Lewes. The author was a Flying Officer in the RAF Volunteer Reserve (VRT) and is an Honorary Member of the Welsh Guards Association.